If a queen cell is introduced into a colony that is queenless or has only just been made so, there are queen pheromones circulating that tells the colony they have a queen and don't need a queen cell, so they destroy it. Well, that's humanising the situation a bit, but is what we think the bees are thinking. The cocoon in a queen cell is thicker at the bottom of the cell, making it tougher for the bees to chew, so if they wish to destroy it, they chew into the cell from fairly high up the side wall and remove the contents. To stop the bees destroying the Q/C in this way we protect it, so they can't get at it. I think to be safe, you need at least 12 hours queenlessness before putting an unprotected Q/C in a colony, but 24 is probably better. You can sometimes get away with less than this, but why risk a potentially good queen? There are many methods and types of protectors, with a small selection here. I have noticed the suppliers are now often selling in quantities of 10, where previously they were sold singly. I think that probably reflects the fact they are small and easily lost. Many of these items also appear on the Plastic Bits page, but there are others here that are not made of plastic. This is a simple and traditional method... It consists of two parts, the coil of wire and a square of tinplate that has its corners bent down at a slight angle. The tinplate can be slid in between the cell. If a cell has been formed on a plastic cell cup or some other substantial base then the tinplate can be left out. The coils are pulled out slightly when used, but care should be taken to ensure that the gaps between turns are less than a wire thickness and are even all the way down the cell. The stub of wire that sticks out is pressed into the comb surface to anchor the device. As the diameter is rather more than a bare queencell it may be prudent to crush a few worker cell flat to the midrib to ensure that adequate numbers of workers are able to surround the cell in order to maintain the temperature. The drawing at right shows the slightly expanded coils and the tinplate closure plate in position. Queen cells are much narrower and do not have the same shape as the internal profile of the spiral. Be careful not to rattle the cell about inside the protector especially if it is several days until emergence is expected. This type has been superseded by the plastic protectors. This is a solidly made and precision engineered item that has a screw on lid. They are a marvel of Victorian design and, when polished, they are a joy to look at, but they are no better than any of the plastic types. The depiction here has been redrawn from a Wedmore original, but shows the same style. This style of cup can be used in conjunction with a tinplate 'cookie cutter' to house small portions of comb, in a similar fashion to cellpunching. This is inexpensive and readily available. You can use cooking foil or chocolate wrapper. A simple way is to fold the foil in half, then in half again the other way. Cut the corner off, so when the foil is opened there is a square hole in the middle, just large enough to put the tip of the Q/C through. Then wrap the foil round the Q/C. The foil should be large enough so the top of the Q/C is covered. Roger Patterson's pictures show a cell that has been formed using a cell punch that has an aluminium foil wrapping. This one was quickly made from a foil pie dish that I had in my lunch box. Beekeepers are resourceful! I find this is the simplest method and although I have proprietary cell protectors, I prefer foil. Is something that I have never tried, but I carry such tape with me when I am beekeeping and so it would be available if I had no alternative. I can see it being difficult to effectively attach such a wrapped cell to the face of a comb. I am concerned that it would be difficult to wrap the tape around without damaging the cell in some way. The Nicot type cell protector shown at right can be used with other items from the Nicot Cupkit range to allow emergence into a cage or direct into a nucleus. There is a cap that will fit the large diameter top of the protector to shroud the back end of the cell. just place the cell inside the device allowing it to sink until the outside of the cell locates on the inner rim of the neck. JZ - BZ comb side type... This version has barbed protrusions to enable the secure fixing of the combined cell and protector simply by dimpling the comb face with a thumb and pressing the prongs into the compacted wax. It is a rather small device and the back end of some longer cells may not be adequately protected. The JZ - BZ between frame type has shorter prongs and they stick out on both sides so that the loaded cell protector can sit between two adjacent frames. The body of the device is also much longer than the push in type so that it dangles below the woodwork of the frame top bars. Plastic type made by Nicot, part number CNE8. Woven bamboo protector... I have never seen one of these personally, but it was described to me by a commercial beekeeper who had seen one. It is very like the JZ - BZ type, but is made from fine slivers of bamboo that are basket woven. The illustration is my interpretation, but should not be far from the mark. Original text D.A.C. edited and expanded by Roger Patterson. One trick that I learnt from an old beekeeper and I have used for a long time is to induce supersedure by giving a queenright colony a protected queen cell. The new queen emerges, gets mated and replaces the old queen. I have had failures, but with me it has probably worked in 80% of cases. The main benefit is there is no brood break and you retain an old queen in case the new one fails. 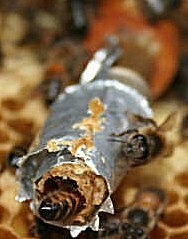 I have used this system of replacing a queen in a bad tempered colony on a few occasions and it has mostly worked. I mean vicious colonies it is very difficult to handle. Smoke as heavily as necessary, remove supers and queen excluder and put the protected Q/C between the top bars. I have only ever done it using foil to protect the queen cell. You can form it so there is excess foil at the top, so it can be folded over the top bar of the frame to prevent the cell dropping. You may have to move one frame slightly. If the colony is very bad tempered, then move it on a good flying day to reduce the number of flyers. R.P.